The scenario is, unfortunately, becoming more and more common: we discover a new species, but it’s already threatened by extinction. The same thing has now happened with a bird species in Africa. While Mountain Sooty Boubous occupy high-elevation forests, recently discovered species live in mid-elevation forests. Image credits: J. Engel. Africa’s Albertine Rift region is a biodiversity hotspot — you could hardly ask for a more spectacular area. It spans six countries, including the rift valley and the surrounding mountains. However, this amazing ecology is threatened by deforestation as a growing population seeks new farmland. Illegal timber extraction is another problem, and artisanal gold mining causes even more damage. 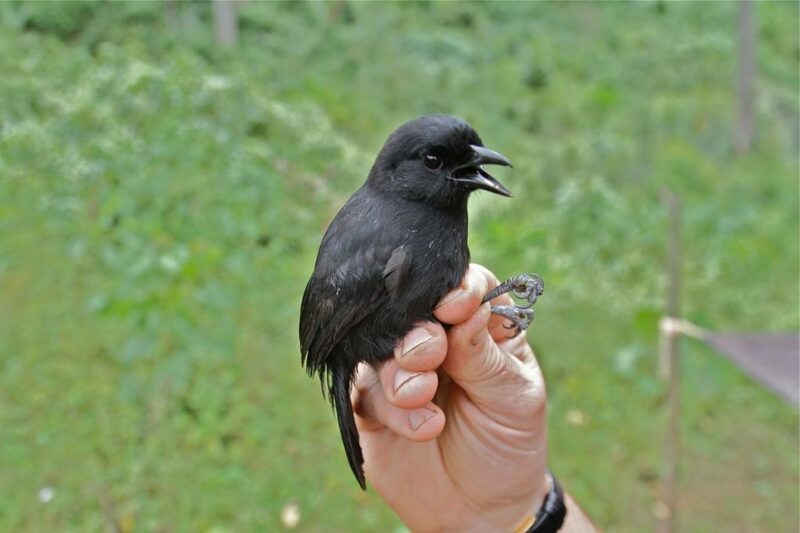 While carrying out a survey of the area, biologists discovered a new bird, which they named Willard’s Sooty Boubou, as opposed to the previously recognized high-elevation species, the Mountain Sooty Boubou. Although the birds seem otherwise quite similar, Willard’s Sooty Boubou is found at approximately 1200-1900 meters and the Mountain Sooty Boubou at 1800-3800 meters. The team was quite happy to find the bird, but after analyzing its habitat, there were fewer reasons for joy. More than half of the bird’s habitat has already been destroyed for agriculture and, in Burundi, Rwanda, and Uganda, some 70% of the habitat has already been transformed. If we want this bird, and other species, to be able to survive in the future, conservation measures are essential, says Fabio Berzaghi, a member of the team who published the study. Ultimately, this is more than just a scientific endeavor — it’s not like finding a new species is the end things; quite the contrary. By identifying it and seeing what ecological niche it fills, scientists can know how to better protect it in the face of growing threats. Berzaghi hopes that the work won’t be in vain, and the diverse habitats of the area will receive the attention they so desperately need.